A lot of things can go wrong during a usability test. You might forget to bring that Ethernet cable, lose your Internet connection, or even leave behind the testing protocol and be forced to fly blind. Potential problems abound. Preparation is vital. But…none of that matters if your participant just doesn’t show up at all. One of the most frustrating—not to mention time-consuming and financially burdensome—components of usability testing is the no-show. People forget; people have other priorities; people have emergencies. It’s to be expected, even accepted. Most usability professionals make sure to recruit alternate participants to account for these no-shows. And most usability professionals make sure to offer the participant some compensation—cash, gift cards*—for being a part of the study. Ultimately, you're asking participants to give up their time—and maybe a three-martini lunch or a nap—to sit in a chair and tell you all their feelings about a website or a system or a platform while a stranger watches everything they do and takes note of everything they say. And we try to temper that awkwardness with the old “We’re testing the system, not you” line. Regardless, it’s an imposition on their time and a strain on their comfort level, and the kindness of strangers doesn’t often stretch that far. Not everyone gets usability testing. In fact, most people don't even know what they're signing up for when they agree to do a usability test. Testing is a big part of what we, as user experience professionals, do for a living, so of course we can't get enough of talking about buttons and search bars and how-do-you-feel-about-the-information-you-see? But for the average participant, there's a degree of uncertainty and intimidation that doesn't exist if you ask people to, for example, donate blood for a good cause. Also, depending on the system you're testing, you’re more than likely not asking someone to help society or participate in a study to cure cancer. You're asking them to help make it easier to buy stuff on a website. Of course other priorities are going to pop up. There’s nothing you can do about a personal emergency, of course, but there is something you can do to make people want to remember, and want to prioritize, your usability test: incentivize them. Incentives exist all over our daily lives. People aren’t inclined to do something for nothing. It’s not a judgment on society; it’s a statement of reality. Our parents offer us dessert if we eat our veggies; our bosses offer us a bonus if we meet our quarterly goal. We even feel obligated to provide incentives to our friends and acquaintances. My coworker needed a ride to work for a few days, and so he gave me a bottle of wine. I asked my good friend to cat-sit for me, and I bought her dinner and drinks to say thank-you. This is the rule, not the exception. Why, then, would we ask—and expect—a complete stranger to give up two hours of their time to the uncertainty of a “usability study” without giving them a little something in return? There are a few reasons why clients are hesitant to incentivize participants. Public sector clients don’t want to use taxpayer dollars for something as new and nebulous as a “usability study.” Clients in the private sector are reticent to appear as though they are bribing customers. There are often internal bureaucratic hurdles that clients would rather avoid dealing with. Sometimes clients don’t like the incentive price tag; sometimes it’s just against company policy. Regardless of the reason, we feel strongly that the benefits of incentives offset the costs—both figurative and literal—of not incentivizing. Incentives are vital to the success of a usability study. Not only does an incentive make it clear to our participants that we’re serious about what we’re doing, and that what we’re doing is valuable; it also serves as an insurance policy that our participants show up. The amount of time and money wasted on a no-show far outweighs the cost of an incentive. We’re not saying no one shows up to do a study for free. There are people who still toe the kindness-of-strangers line. But we’ve crunched the numbers, and they are compelling. The following infographic** shows attendance data collected from six usability tests that Design For Use has conducted in the past three years - three with incentives and three without. It's pretty clear that incentives make usability testing a whole lot easier, a whole lot smoother, and a whole lot more successful. After all, as one of our clients recently noted, how would we get people into the testing chair without incentives? "Promise them cookies?" 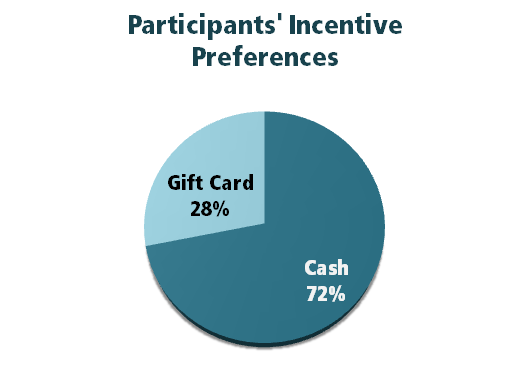 *Participants' preferences for incentives were solicited via Internet survey in September 2012. **Testing data was collected from a combined total of six usability tests conducted between 2009 and 2012.